Back in ye olde days of LiveJournal, there was a popular New Year’s meme that involved going back through your previous year’s entries and copying down the first sentence of the first post for each month. I say popular … I enjoyed it, but then I don’t get out much and my idea of fun does not always match everyone else’s. Anyway, I thought I’d revive the tradition here. I have only used ‘diary’ entries – i.e. ones about Marty and/or Xato, rather than Mule Tales or my pseudo-historical shambles. January: Xato is off work at the moment because I’m a little concerned that he may still be having issues with his back. Ah, yes – Xato’s ongoing dodgy/not dodgy/who knows back, which we’re still not at the bottom of (if you’ll excuse the pun. His main issues seem to be in his hips). The vet had a look at him the other week when he came out to do Xato’s second Dectomax injection, and pronounced him sound and level. Xato’s trim-before-last was the best he’s ever been for having his feet handled and trimmed, but he was back to his usual curmudgeonly ways for his latest appointment. February: Ben and I have been together for nearly 6 years. Hurrah! After six years, Ben and I FINALLY rode together, for the first time, on our own equines. It may have only been round the field but it was a good day (Xato found it rather boring, however). March: Xato’s steering and brakes have been an ongoing project since he arrived. Oh dear … this was about when he bolted with me. Reading back I still find it really interesting how he went to each gate in turn; I think he would have taken me over to the other two gates if we hadn’t been stymied (thankfully) by the brick pile. I sincerely wish it hadn’t happened though, as before this I’d felt on top of the world when riding him and completely, absolutely safe. I’d really thought my days of being a Nervous Nelly when riding were over! Ah well. Life happens. The video is one of our “liberty” sessions which I’d forgotten about, so that was nice to revisit. April: Alright; first of all, I apologise for how quiet things are getting on here. Haha – the beginning of my many hour workdays! 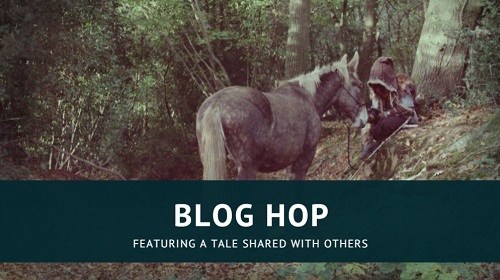 We’d started running Horsemanship Magazine and Mulography had to take a regrettable backseat. Also, look; a time when Marty could actually bare to be near me. What a terrible mule. May: Last weekend, Xato and I attended Joe Wolter’s first UK clinic down in Devon. …And I still haven’t got round to writing up the clinic yet! It was just too good. I’m still thrilled that I got the opportunity to ride and learn with Joe Wolter and would 110% recommend you come along when he’s back in the UK in August. 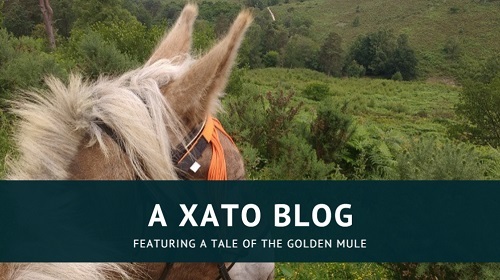 June: Facebook friends will have seen that Xato and I have been doing a lot of riding out lately, in the company of our fabulous friends Samantha and Fi and their Spanish mares, Edita and Chiquita. Gods, I had such a good summer with Xato! It was so much fun to finally be out there, exploring this beautiful area on my own equine for the first time. This post is rather picture heavy but they’re all good’uns! 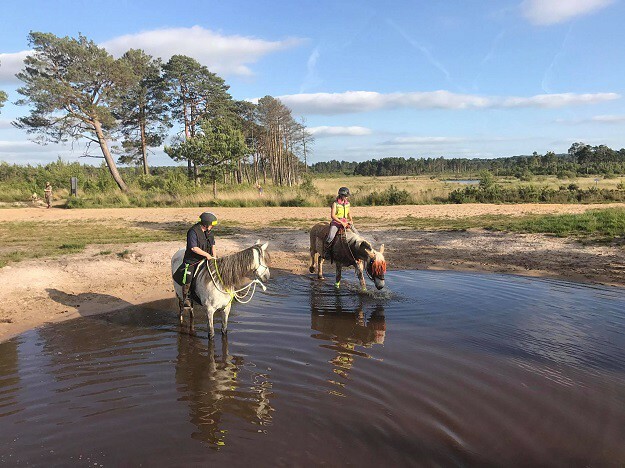 I like this photo because it was really cool to be riding through the pond, and really funny with how keen he was to go for it. He’s since shown himself to be quite the water baby. July: For the past two weekends in a row, Ben and I have been enjoying exploring the Punchbowl with our respective steeds. More amazing rides!! I adore the Punchbowl, and riding to the cafe was one of my very-boring-but-important-to-me bucket list items. 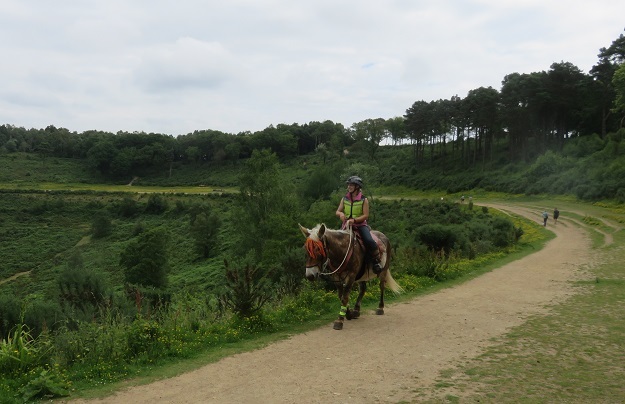 This was also the ride where I was super brave and faced my downhill fear by riding down the steep hill into the Smallbrook Valley. This photo is of us on the old A3 – it used to run around the edge of the motorway, but now goes through a tunnel instead. The old road has been returned to nature and it a lovely track to walk and ride on. 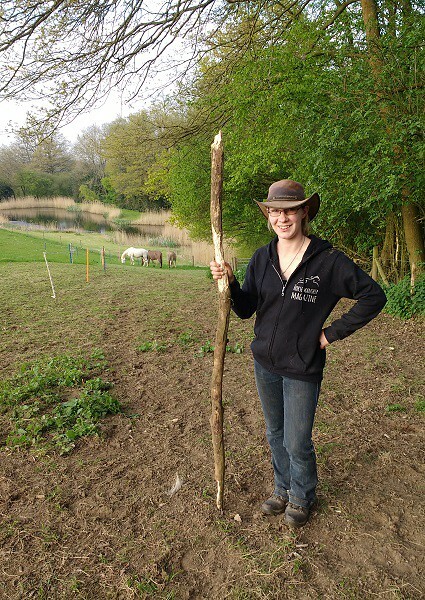 August: I haven’t done a written update for some time – not since our ten mile weekend at the end of June! The ten mile weekend was another great weekend of riding, ticking another ride of my bucket list. 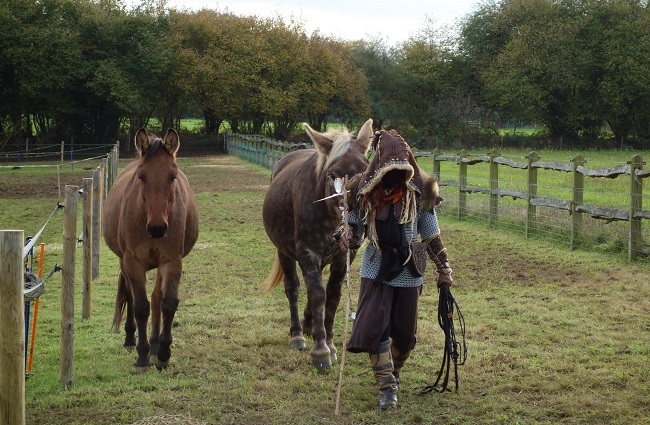 I was also venturing in the muddied realm of vlogging by this point (it didn’t last long: I am a writer, not a speaker), the mules were of the opinion that fencing was optional, and Xato was being awesome as usual and carrying my haynets for me. 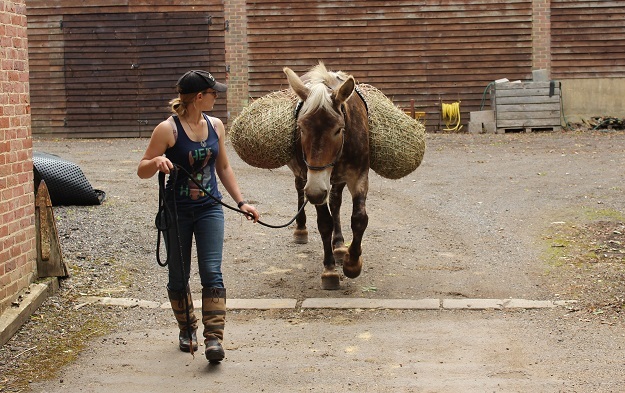 September: I apologise for the lack of written updates recently; gone are the days where I could wax lyrical about the minute intricacies of my mule days, boring you senseless with my blow-by-blow view of what happened/what might have happened/why what happened happened. Still struggling to update the blog! Apologies all. But think of all the pointless waffle you’ve managed to avoid. 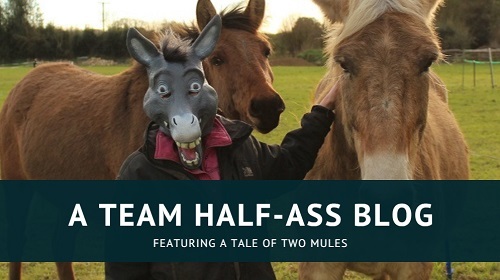 Anyway, this post was about the Brooke Hackathon myself and the mules took part in along with other members of the British Mule Society. By the end of it, we’d raised a combined total of £514 and had covered over 500 miles between us. The video is a combination of clips from one of Marty’s contributions to the cause! October: With Samhain / Hallowe’en incoming, I took Xato into the woods behind their field and, with Ben on the camera, we took a few fun shots. The actual first sentence of this post was me apologising about lack of updates again, so I skipped that. This photo isn’t from the actual shoot and was taken as I walked back to the yard afterwards, but I love it for its weirdness. November: The current issue of Horsemanship Magazine features an article and a cover photo from Lucy Chester (you may know her from her Instagram, @haflingeratliberty). The post with the most hyperlink-heavy first paragraph of all time! 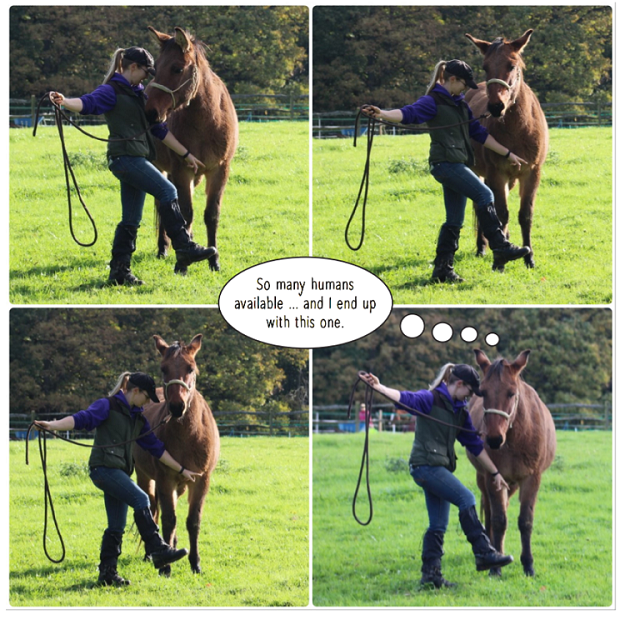 Also about mine and Marty’s lesson with Lucy Chester. I did a better job at Spanish Walk than he did, just sayin’. 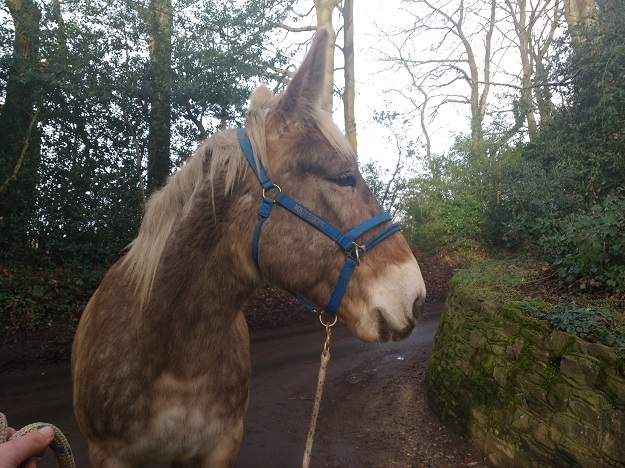 December: Since Austria I have been feeling really keen on the idea of just walking with my mules. 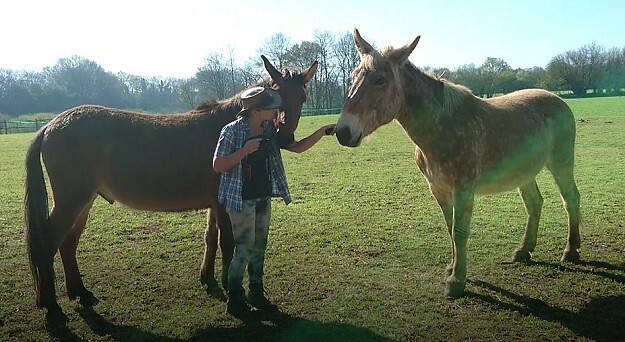 I hope to get back to this soon; I haven’t done anything at all with my mules so far this year. I think we might have a free weekend coming up … perhaps we can go for another hike together then?